Want to try the 21-Day Sugar Detox, but not sure how to get started? Join my Facebook group, and I can walk you through it. The group detox will start on March 2, 2015, and finish on March 22, 2015. You can join at any time, but if you want to follow along with the group detox, I very highly recommend you join no later than February 23, 2015, so you have time to prepare. 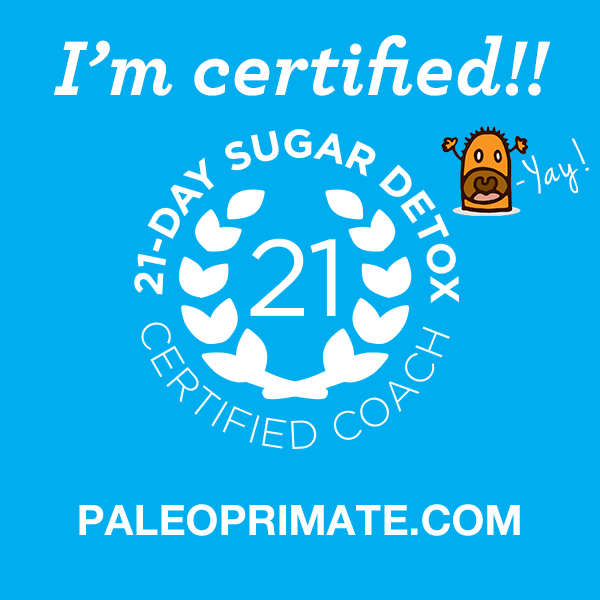 The 21-Day Sugar Detox online program: This is my personal favorite. You’ll have access to a quickstart guide and lots of online materials, plus you’ll have the option to add the guide book and cookbook. When I did my first 21DSD, I chose the premium package, and have found it to be a great investment in my health. The 21-Day Sugar Detox guide book: The guide book is a great resource. It includes a ton of great background information about how and why the 21DSD works, along with the yes/no food lists, modification guides, meal plans, recipes, and more. The 21-Day Sugar Detox cookbook: The cookbook contains a condensed version of the 21DSD background info, along with the food lists, modification guides, meal plans, and even more recipes. You’re Invited to a “Paleo Perfection” All-Natural Wildtree Freezer Meal Workshop! Come early for the 9am free WOD at CrossFit Iniquus, and then stay for the freezer meal workshop afterwards. Tired of making the same 6 dinners over and over? Do busy nights force you to grab take-out more than you care to admit? We have the answer! Come to my Wildtree Freezer Meal Workshop! Prep 10 dinners to take home, freeze and cook on busy nights to come. Sound delicious? Visit the Facebook event page to sign up! Payment info will be posted on the Facebook event page. Step 1: RSVP to Chrissy by Fri., Feb. 13th. Then our Wildtree Rep, Carol, will contact you for payment. Step 2: Carol will email you the grocery list and pre-workshop prep instructions for the above meals after the order has been placed. Step 3: Come to CrossFit Iniquus with your cooler of meat and veggies. We’ll add the Wildtree products and other ingredients AND have some fun! NO MSG! NO HIGH FRUCTOSE CORN SYRUP! Is eating better one of your New Year’s resolutions? Learn how eating like a caveman (or woman) can help you feel better, lose weight, increase your energy, and more. Join us for the free 9am WOD at CrossFit Iniquus, and then stay for the party. We will have information about paleo eating (in general), as well as some more specific “resets,” including Whole30 and The 21-Day Sugar Detox, and resources for finding paleo food and drink locally. Of course, it’s not a party without food, so we’ll have some of our favorite paleo recipes for you to try (with recipe cards to take home), and even some paleo-friendly beverages! Please visit the Facebook event page to RSVP, so we know how much food and drink to have at the event. Getting started with paleo can be daunting if you’re used to eating the Standard American Diet (SAD :-(). If you don’t know where to begin, it might help to use one of the following plans to really map out exactly what you need to do. They will give you guidelines, yes/no food lists, recipes, shopping lists, and much more.